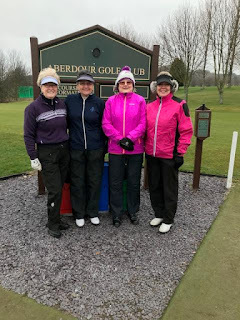 Today at a dry, bright, but cool Elmwood we saw some excellent golf from all the semi-finalists and finalists in the County Championship and the Handicap Championship and congratulations to all the ladies concerned. The Final of the Championship was contested by new member, Gillian Paton (St. Regulus) and former champion, Elaine Moffat (St. Regulus). This was a lovely Final to watch with super golf played in a great spirit and Gillian emerging the Champion by the winning margin of 3&2 - the difference between the two being Gillian's birdies coming at the right time of the round at the 12th and 15th. Many congratulations to Gillian. (Ladybank) by 2&1 in a very close match. Jude's fitness levels will surely have risen after this weekend with her three matches going the full distance. Well done to both ladies." Click here for the results and semi-final draws from todays (Saturday 28th April) Scratch Championship Match-Play games. Click here for the results and semi-final draws from todays (Saturday 28th April) Handicap Championship Match-play games. Fife County Juniors have retained the Cuthbertson Cup - (Inter-county Junior Team event) with a 100% record. Fife played against Stirling & Clackmannanshire in the morning matches, winning all 4 games. They then played against Midlothian in the afternoon matches and again won all 4 matches. What a fantastic achievement, well done girls. Further report and photos to follow. The result of the Winter 4's Bronze Division which was played on Tuesday 17th April was a win for Alison Paterson and Caroline Mackey from Dunfermline 3/2 over Christine Mathers and Sheila Will from Ladybank. It was a very blustery day and Aberdour is still very wet underfoot in places but it stayed dry overhead. The players (and President!) were treated to a soft drink and scone after play. Thanks went to Aberdour again for the courtesy of the course on both occasions and for juggling days with the weather. 53 Ladies played in the County Spring Meeting today at a bright and breezy Elmwood. The course was in good condition considering the recent weather we have had, the greens were excellent, although many found the slopes and some of the pin positions very tricky. The CSS for the day was 74 Reductions Only. The match-play draws will be posted shortly. "WITH A LITTLE HELP FROM YOUR FRIENDS"
On a perfect golfing day at Ladybank on Saturday 14th April, Fife and Perth & Kinross halved their annual friendly match with three points each but Perth & Kinross may have Fife to thank for that after Fife allowed them to "borrow" Vice President, Lorna McKinlay, for their team when a late withdrawal left Perth & Kinross one player short. The golf course was in lovely condition and enjoyed by all the players including the six Juniors included in the two teams. Thanks go to Ladybank Golf Club for hosting our match and thanks also go to the catering staff for our superb bacon rolls & coffee etc before play commenced. 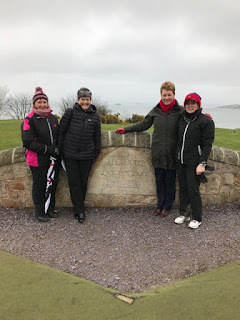 The re-scheduled final of the Winter 4'Somes Silver Division took place yesterday, Tuesday 10th April at Aberdour Golf Club. To say the weather was miserable was a bit of an understatement!!! 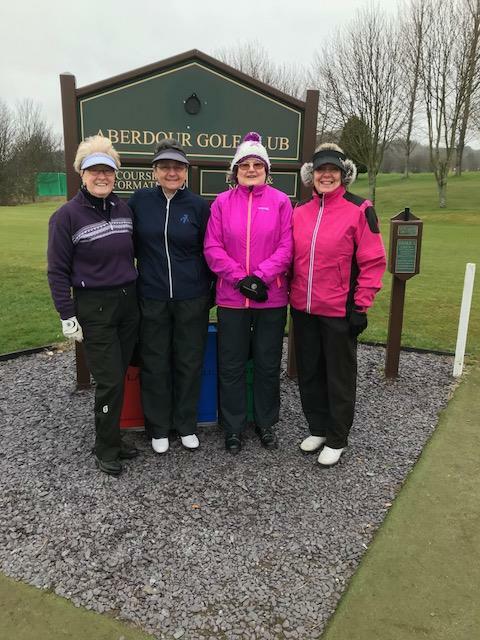 It was baltic and wet for the 4 players taking part, from Dunnikier Park Golf Club and Kinghorn Golf Club. Margaret Kilpatrick & Lorna McKinlay, Dunnikier Park played against Joan Tulloch and Fiona Mustard, Kinghorn. Margaret & Lorna came out on top with a 5 & 4 win. 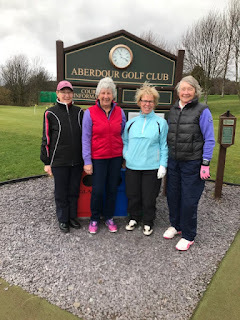 "We were so glad to get in for a warming cuppa and a lovely scone"
Thanks go to Aberdour Golf Club for allowing us to play the course and thanks also go to the green-keeping staff and the bar/catering staff. Click here for the draw for the Spring Meeting/Championship Qualifying Round to be held at Elmwood Golf Club on Sunday 15th April. Today at Aberdour Golf Club, Aberdour member and a previous FCLGA Treasurer Helen Thomson was awarded with her Life Membership Award. 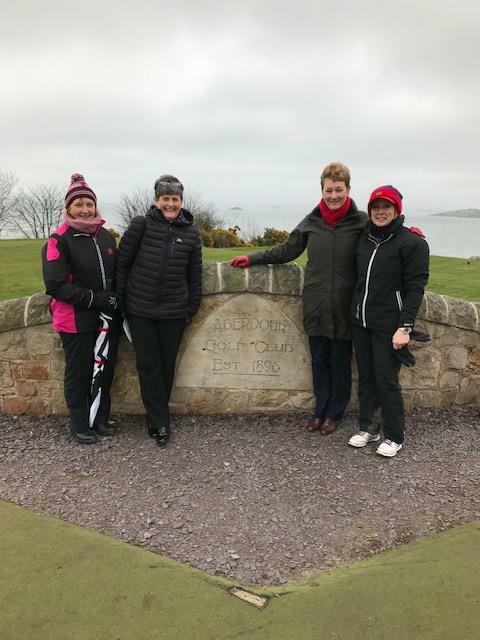 There were 10 people present to see this happy event, a mix of county officials and Aberdour Members, where there was plenty of chatting, reminiscing and off course tea and scones enjoyed by all. Pictured below is our President, Susie Robertson with Helen and her Life Membership Award. Well the season started in glorious sunshine at St Michaels this Easter weekend with a ''healthy'' entry of 32 couples in the Presidents Cup. Conditions were dry and sunny with no winter greens or mats to be seen - winter cobwebs 🕸 were blown away and for some the season has started well. Very close between the first 3 places. Well done to everyone who took part, and good luck to you all for the rest of the season. Thanks go to St Michaels Golf Club for hosting our event today, the course was in great condition considering all the rain and snow that we have endured over the last few weeks, also thanks to the bar and catering staff who kept us all fed and watered.